Having met up with the masses from the French Camino, today was definitely uncertain as to how busy the way might be. Although many left before 6am, Mikey stuck around until 7:30 in hopes of letting the path clear out a bit. 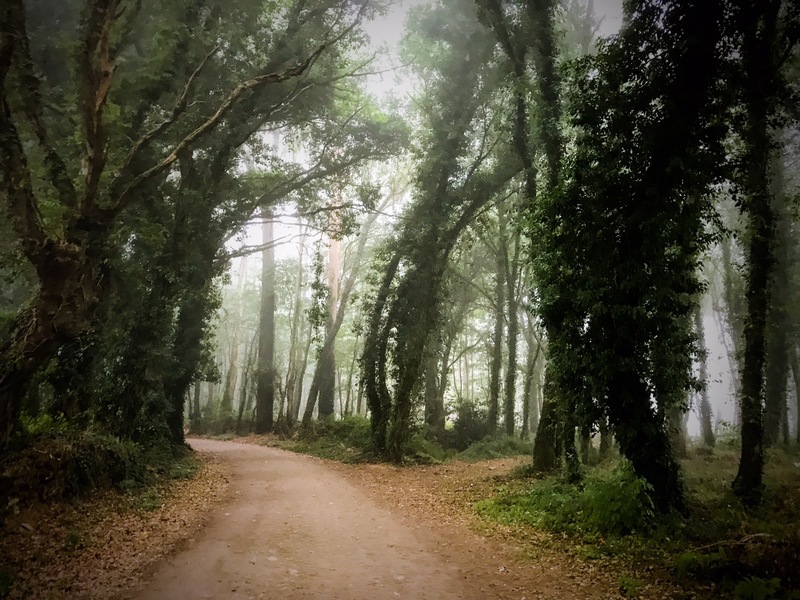 We were surprised to meet the Portuguese couple at a cafe right outside the albergue and joined them for a pre-Camino coffee before heading out into the foggy morning. One of the few times when the road wasn’t inundated with pilgrims. Kind of ominous, don’t you think? This was the real scare. 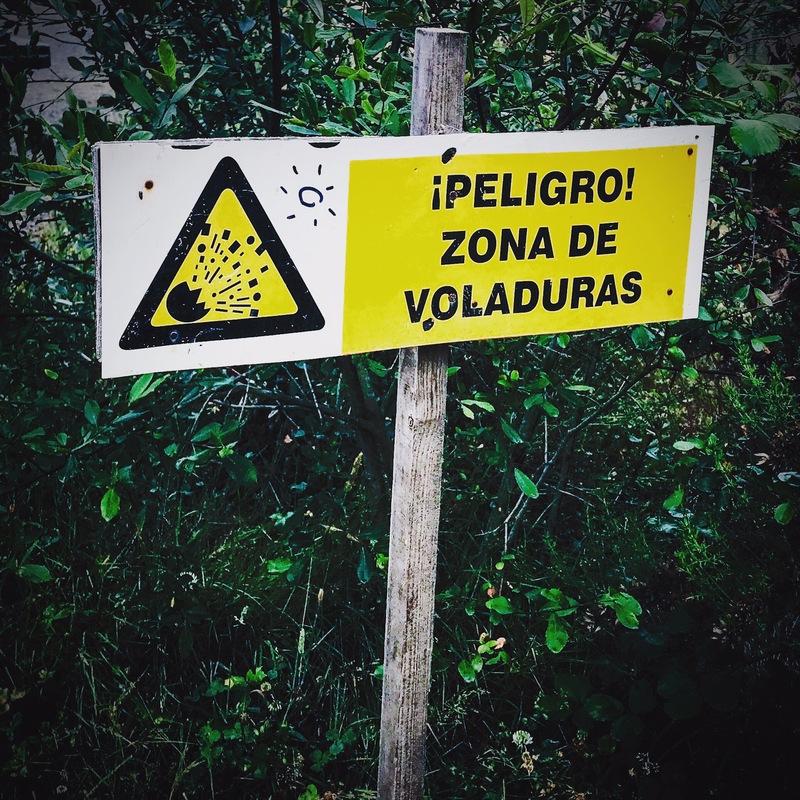 Translation into English is, “Danger! Blasting zone.” WHAT?! Needless to say, Mikey picked up the pace and headed towards breakfast. 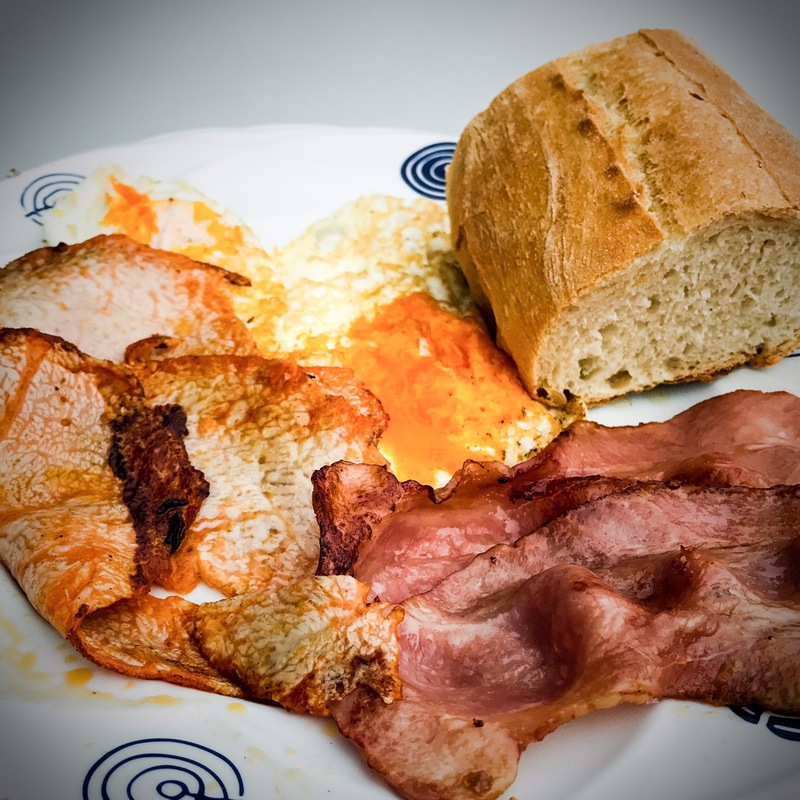 If you followed Mikey and Frank on last year’s French Camino, then you already know about this breakfast spot out in the middle of a field. 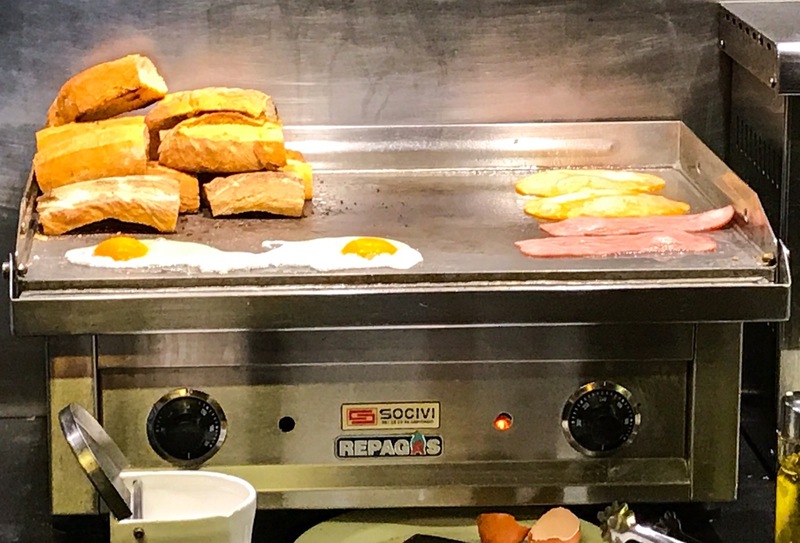 Again, Mikey ordered the fried eggs, bacon, and pork loin for 3.50€. And if you’re wondering, all the ingredients came from the adjacent farm. Yum. To be honest, O Pedrouzo is really underwhelming. 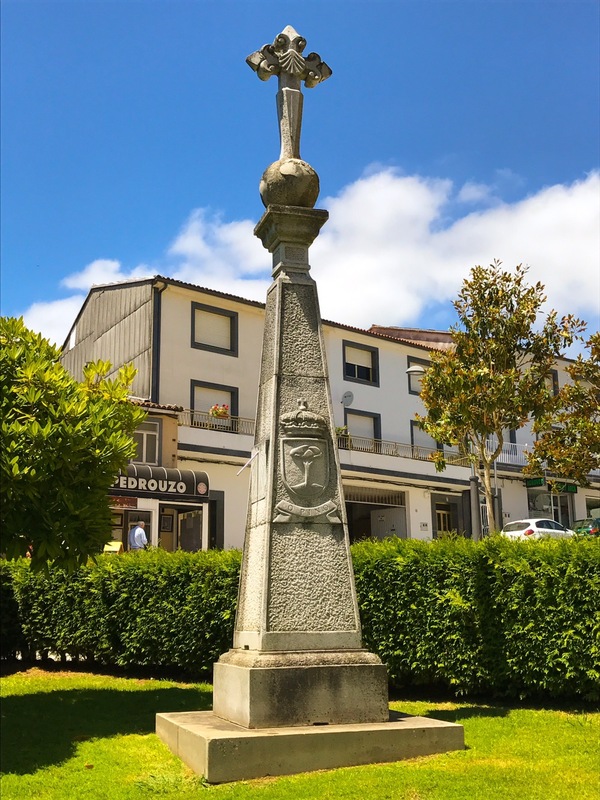 It has the single fortune of being located some 20km away from Santiago and is therefore a penultimate stop for many pilgrims – the final one being Santiago. As one of Mikey’s Irish Camino friends would say, they’re trying hard to earn the last of the pilgrims’ pounds. Mikey made his obligatory walk to the town church before showering and resting for a bit. 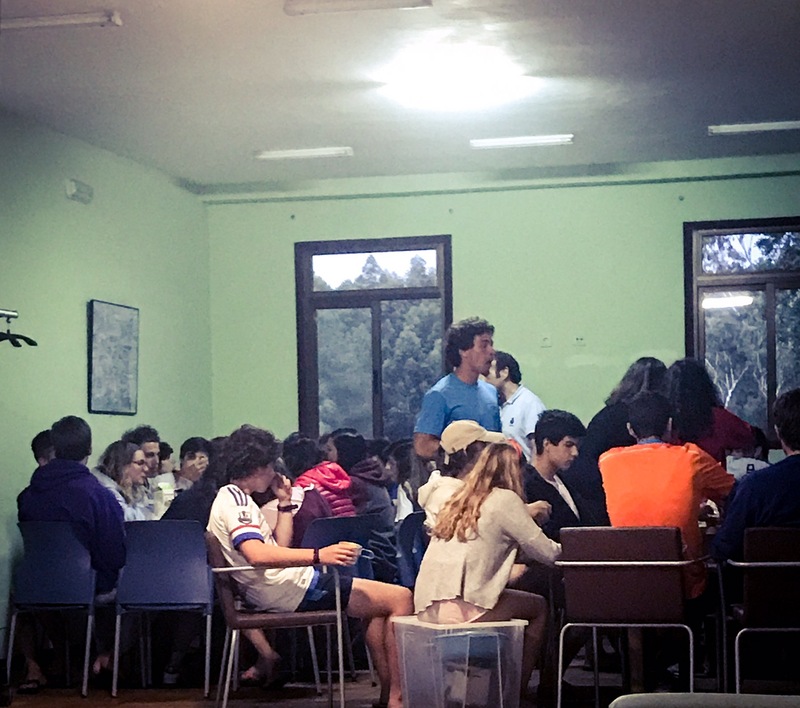 Yes, we’re almost there, but both the number of Spanish teenagers and prior Camino experience leads us to believe that many travelers will be far too exited to sleep tonight. However, just as soon as he thought about settling in for the evening, Mikey ran into a couple of people he’d not seen in a while. Before we knew it, there was a table of pilgrims enjoying local craft beer and wine. Perhaps these are the images cameras invariably fail to capture – those where the conversation flows freely and recent acquaintances joke and pick at each other like old friends. 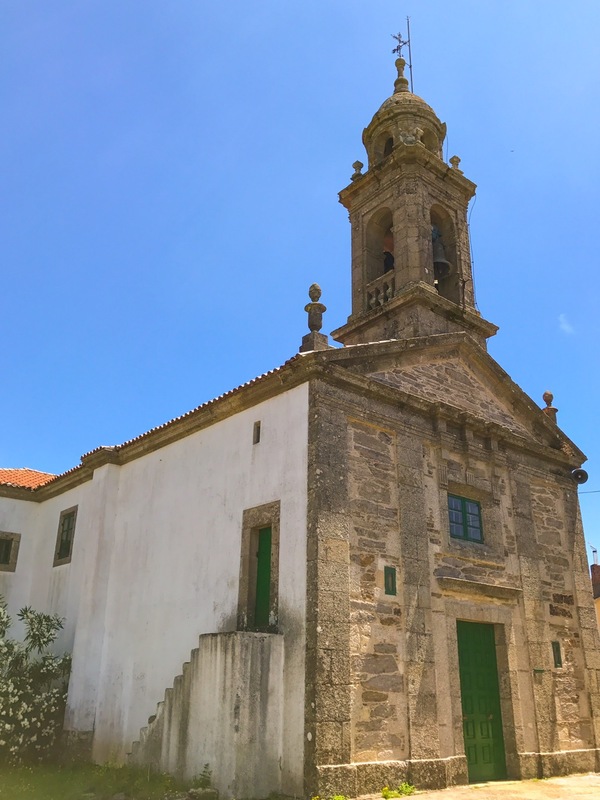 Camino gossip is exchanged, final tips are shared and debunked, and Mikey learns that he is known as “the quiet guy.” Don’t worry, there are also “the loud Americans” whom many try to avoid, the “Dutch juvenile delinquents,” that young Polish priest, and a “Mr. Miyagi” who is often seen folding origami and picnicking solo. Before long, we had laughed away the evening and it was almost 10pm (curfew). We walked back to the albergue for one more night’s communal rest before Santiago. One of us will watch her camino friend/priest celebrate mass at the cathedral tomorrow before she heads back to Germany. Two are calling on old friends in Galicia and then taking a bus home to Porto. Another is meeting her mother for a planned European vacation and will then fly back to her native Brazil. On and on the plans go. 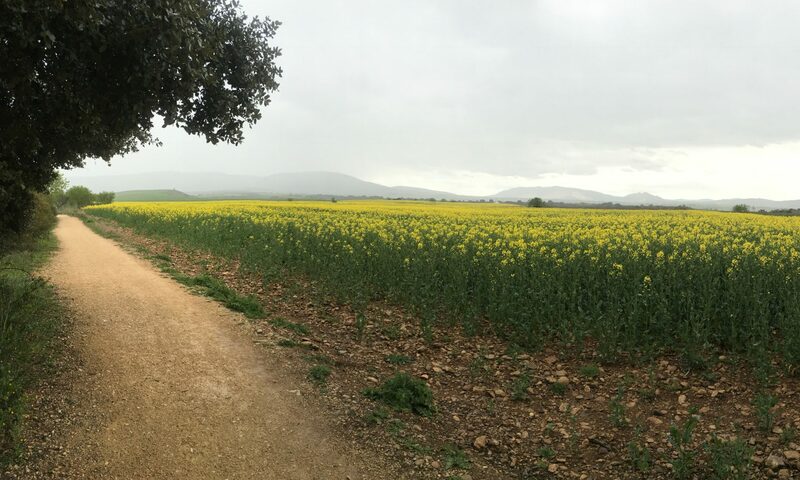 We all walk to Santiago, but each camino is as different as the pilgrim who makes it. Thank you for joining me on this Camino de Norte. Still, as we say goodnight to you, this is not goodbye – not by a long-shot! I mean, we have to get you to Santiago de Compostela tomorrow! Oh, and then Mikey’s going to rest, but we’ll make sure you see some of Galicia and maybe the Atlantic coast before we head to Portugal for wine tasting in Oporto, a high speed train to Lisbon, and then an overnight journey to Madrid where we will try out some new craft breweries. So, stay focused people! We still have lots of time together. Oh, and if you aren’t yet following Mikey on Instagram, you should be! Yes, these blog posts are a bit more comprehensive, but the Instagram account gets you more realtime and unfiltered updates as it all goes down. OK – enough shameless promotion. Goodnight and we’ll talk next from the “Emerald City” of Santiago de Compostela!